You need a simple, yet stylish template for personal site? Then JB Woodflower template is what you need. Template JB WoodFlower has a pleasant design and despite the bright colors and shades, it looks great on screen. Besides template JB Woodflower has the choice of colors and options for layouts and modules at its discretion from several possible schemes. To be more precise, such that variations in the pattern JB WoodFlower preset 50, and color styles in the template JB WoodFlower there are 15. 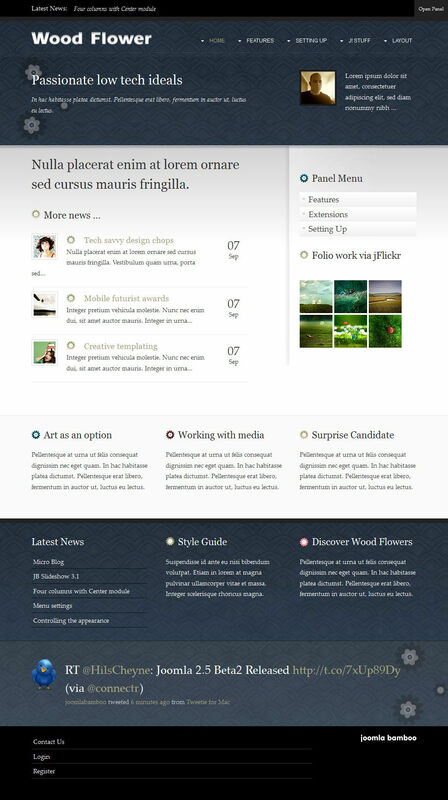 Besides template JB WoodFlower has built-in functions: jQuery accordion-like panel menu and JQuery Superfish Suckerfish Menu. Template JB WoodFlower installed on Joomla 1.5.